I was chatting with my friend, Adeline from The Accidental Mom Blogger one day not too long ago and we spoke about linking up and cooking 2 different dishes using the same main ingredient. We did that once last year - check out our posts on hae bee hiam - and I thought it would be fun to partner up again, especially since Adeline is a damn fine cook! Our theme this time round is kway teow. 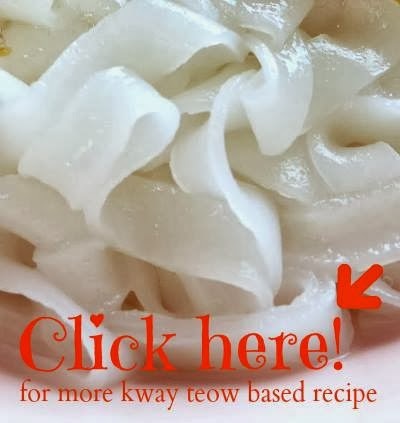 Kway teow comes in so many forms - from the big square-shaped ones used in kway chap, to the long thick ones used in seafood hor fun, to the flat slightly thinner ones used in char kway teow, and the long and thin ones used in Ipoh hor fun. All of which, I love. 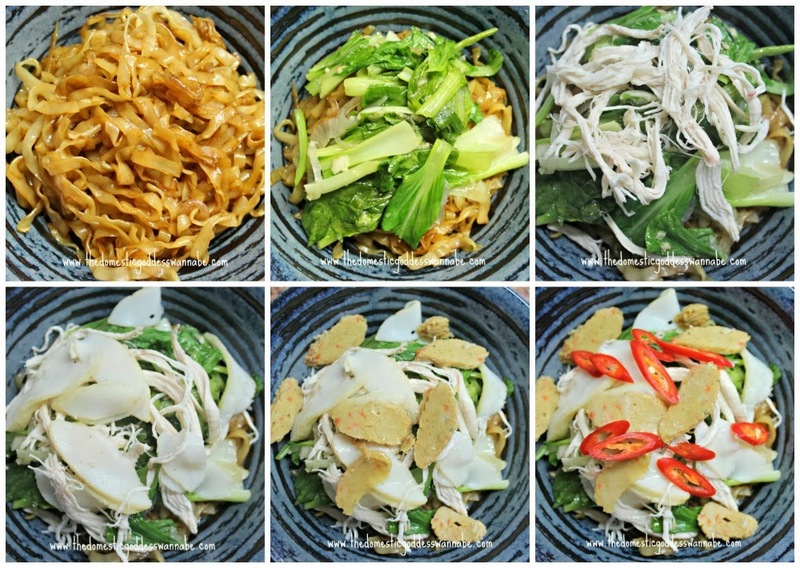 Today, I am sharing a super quick, and super easy shredded chicken hor fun recipe, and I am using the long and really thin kway teow. The reason why I have chosen to use this instead of the thicker kway teow is because this type of noodles is more easily available. You can get them in any supermarket, and they even come in dried in packets. If you are using the dried noodles, you will need to rehydrate them before they can be eaten. I can whip this dish up in 20 minutes (or less). Here's how I do it. To start, I sliced shallots, ginger and minced the garlic. I stir-fried half the shallots in hot vegetable oil. Once the shallots had softened, I added the noodles. I also added light and dark soy sauces and stirred to mix. This was then transferred to a bowl and set aside. In the same wok (no need to wash), I added a little more vegetable oil. Into this, I added ginger, garlic and the remaining shallots. Once the shallots had softened (it would not take very long), I added chicken stock. The chicken stock was brought to a boil, and I blanched the vegetables in the stock for about a minute. The vegetables were then removed and set aside. If you are using any other raw ingredients (eg, prawns, squid, pork, etc), just blanch them in the stock until cooked through, then fish them out and set aside. I removed the ginger slices because I don't like biting into them. If you like ginger, then leave them. I added more light and dark soy into the stock and made a sweet potato starch slurry (you can also use corn starch) and added that slowly into the stock, stirring continuously. Once the stock had thickened (how thick depends on your preference), I turned off the heat and added a little white pepper to the gravy before stirring to mix. To assemble the dish, I placed some noodles in a bowl, then added the vegetables, shredded chicken, sliced fish cake and ngor hiang, and chilli. I had some shallot oil, so I added a little into the bowl as well. I ladled the gravy onto the noodles, vegetable and meat, and served immediately. This is one of our favourite meals-in-a-bowl, and it is so quick and simple to cook I really don't mind cooking it any time. 1. Fry shallots in hot vegetable oil until softened (about 1 minute). Add noodles, light and dark soy. Stir-fry until well-combined. Remove and set aside. 2. In the same wok, stir-fry garlic, shallots and ginger for a minute or so. Add chicken stock and bring to a boil. Blanch vegetables (and any raw ingredients) for a minute. Remove and set aside. 3. Add light and dark soy and sweet potato slurry. Stir until gravy has thickened. Add pepper. 4. Assembly the dish by placing noodles, then vegetables and meat in a bowl. Ladle gravy into bowl. 5. Serve immediately, with chilli, if desired. Wanna know what Adeline has cooked? Click on the linky below to find out!